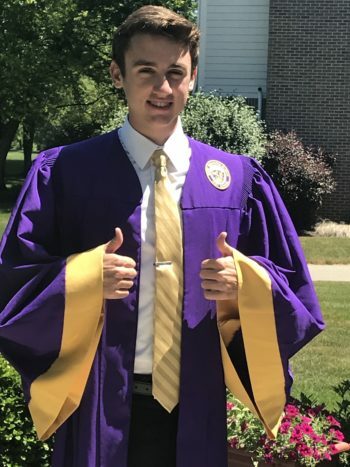 Will Oberndorfer, co-founder of Will’s Way, is a freshman at Purdue University, and graduate of Guerin Catholic High School located in Carmel, Indiana. He is a student leader and type 1 diabetes activist who is thriving with the disease. Refusing to let his disease define him, Will leads a full, healthy and active life. It has been nearly six years since I was diagnosed. Am I happy to be a type 1 diabetic? No, but I sure am grateful. I have been so blessed with amazing coaches, teachers, sisters, friends, and neighbors, however, second to my parents, Diabetes, you have taught me the most. Do you ever take a break? Can’t I just go one day without having you with me? It is a daily cross to bear. Yet, I step back and realize there’s a lesson to be learned. Quitting takes a toll on myself. If I quit or cut corners with you, it will hurt me later that day or in the long run. The same goes for life, I cannot quit because it isn’t easy; I must see the end goal, the end beauty. Thank you for showing me how beautiful my mother and Godmother are. As women tend to do these two ladies took something and made it better. They took my idea and wrote it in their heart for the love of me and more importantly for the love of others. They are working to give their love to people they have not even encountered yet. What can be more beautiful than that? Please pick on me all you want. I can handle it. Not because I am stronger than anyone else with diabetes, but I have been blessed with the resources to combat your plague. I would take 4 shots at each meal for you to stop picking on people who have other illnesses, who can’t afford the supplies, who are too young to comprehend. I wish there wasn’t a need for the beautiful work of my mother and Godmother at Diabetes Will’s Way. You gave me a second home. You gave me lifetime friends. Being diabetic, I got the opportunity to go to Chris Dudley Basketball Camp. It’s a place of love, of common ground, of learning, of community, of compassion. It’s where I feel myself. It’s where I am understood. It’s where being diabetic is no longer a burden, but a blessing. Thank you for showing me the support I was blind to. I see with greater clarity because of you the endless love my family and friend have for me. Thanks for the motivation and inspiration to give back. There is truly nothing greater than giving and receiving a thank you that means safety and peace of mind. Diabetes Will’s Way has been a platform for this joy. Although it may say Will’s Way, I know that the work my mom, Godmother, and board members put in is truly the way of Christ. They give for the sake of others just as He did. When diabetes chose me, it chose the wrong kid…and the wrong family. I am competitive. My family is competitive and we are ready to fight. We aren’t going away quietly. We are fighting diabetes with everything we got, but what I’ve come to realize…it’s not just about me. For me, I have family, friends, teachers, coaches, classmates and teammates who help me stay strong and face diabetes every day. I am lucky. What I’ve learned is that others aren’t so lucky. They may not have the support like I do or the medicine to help them stay healthy. I had no choice becoming a diabetic, but I can choose how I handle my disease. Einstein said, “Only a life lived for others is a life worthwhile.” To me, that’s why this happened. It’s why diabetes happened. So, I needed to do something for other diabetics like me; for other kids like me. So, Willstrong and Will’s Way were born. 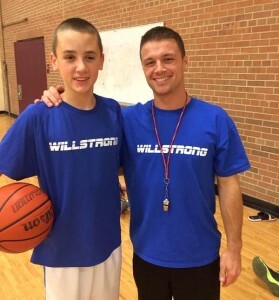 Willstrong was something I wanted to do only a couple weeks after being diagnosed. I asked my mom if we could create T-shirts that said Willstrong on the front and, “Stronger than Diabetes” on the back. We ended up raising a bunch of money (well, a bunch to a thirteen-year-old like me), then donated it all to JDRF Indiana State Chapter. As Lincoln once said, “I am a slow walker, but I never walk backwards.” My donation may not have been the largest, but hopefully it will start a ripple effect that will grow bigger and wider. My wish is to motivate you to join walks, runs, swims, bike rides, golf outings and any fundraiser that can help someone suffering from a life-changing disease. We continue to have a Willstrong community. But, now, I’m ready to do more. I’m ready to make that ripple bigger with Will’s Way, an organization my mom and I started to help diabetics get the care they need to be fully healthy, not just alive. My hope is that I can make a difference in someone’s life. Maybe I can help another junior-high student become healthy enough to make his or her basketball team. That would be great. I will continue to be strong because of my family, friends and the Willstrong Warriors. If you need a little help to fight type 1 diabetes too or want to give to an organization that is helping kids like me, contact us by email at info@diabeteswillsway.com or check us out at facebook.com/diabeteswillsway.